Whew, another day another opportunity to overstate the results of a clinical research study. The study in question is the new study showing that an acidic environment disrupts the circadian clock by inhibiting mTORC1, and this effect can be reversed by buffering the environment with something such as baking soda. While this study does give us a couple of very interesting findings, I wouldn’t go buying stock in Arm & Hammer just quite yet. The first thing I take from this study is the importance of circadian rhythms. It’s largely recognized that inhibition of mTOR(mechanistic target of rapamycin) may be one of the more effective ways of increasing lifespan. So it may be a bit surprising to learn that cancer may hijack the circadian clock by doing the same thing. However, when we look at what mTOR does and how an acidic environment inhibits mTOR, we can see how it can both promote lifespan extension as well as cancer. The function of mTOR is to act as a nutrient sensor. Both carbohydrates and amino acids activate mTOR, amino acids directly and carbohydrates via insulin. Thus, inhibition of mTOR occurs during nutrient deprivation. This ebb and flow is circadian in nature, with activation occurring during the day and inhibition at night in humans. Unless you chronically overeat or eat all day and night. When we inhibit mTOR in animals in a lab with something like rapamycin, there are still periods when they’re activating mTOR. When we calorie restrict them, perform time-restricted feeding, or cause them to fast, we are effectively inhibiting mTOR as well. But, when they eat or break their fast, they’re activating it again. This allows a process called autophagy, where damaged cellular components can be recycled to feed the cell and repair parts can be re-synthesized. Very useful in a healthy cell being nutrient deprived, and also useful for preventing excessive cellular damage from causing apoptosis or cancer. However, in cancer, permanently inhibiting mTOR allows a cancer cell to provide itself with a constant flow of energy. An acidic environment does this by preventing mTOR from interacting with RAS homolog enriched in brain(RHEB), which is needed to activate mTOR. While the study showed that buffering the environment with something like baking soda will allow mTOR to bind to RHEB, that doesn’t necessarily mean you’ll activate it. The problem isn’t that mTOR is being inhibited, it’s that the circadian rhythm has been lost and cancer cells have constant access to energy. The cancer cell is likely using autophagy to provide itself with fuel, something you can do all on your own by eating too much food or during the wrong parts of the day. This study isn’t showing that inhibition of mTOR promotes cancer, it shows that cancer shuts off the circadian clocking by preventing mTOR from interacting with RHEB. Thus, the important takeaway isn’t that mTOR is being inhibited, it’s that mTOR signaling is completely shut off. Most people have no problem activating mTOR because most people overeat. They have plenty of nutrients to activate mTOR with, but cancer would be highly susceptible to nutrient deprivation if it didn’t shut off mTOR signaling. By not allowing mTOR signaling, cancer cells guarantee unfettered access to nutrients whether they come from autophagy or from the food you eat. For proper mTOR signaling, you need periods of nutrient consumption AND nutrient deprivation. With mTOR being a nutrient sensor, you likely need to be practicing calorie restriction or some form of fasting to establish a circadian rhythm. Or, another form of nutrient deprivation that this study likely provides evidence for: exercise. It’s important to point out how an acidic environment is created in the first place in cancer. No, it’s not a lack of vegetables or too much meat. Instead, it’s a build up of something called lactate. 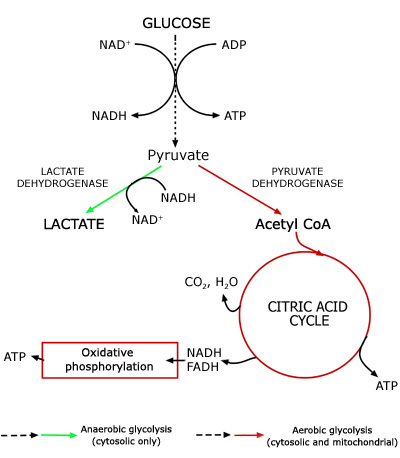 When cells produce energy using anaerobic glycolysis, lactate is often created so that NADH can be recycled back to NAD+ so that the process of glycolysis can continue unabated. While creating lactate allows glycolysis to continue, it acidifies the environment its created in. Along with lactate comes an increase in hydrogen ions that acidifies the environment. You’ve likely felt the burn associated with intense exercise, that’s not lactate, that’s the hydrogen ions. Note: Recent reviews do a good job of explaining how energy metabolism in cancer is very similar to energy metabolism in high intensity exercise. For an in depth look at that, check out this study. Fortunately, most cells have a highly effective way of dealing with both lactate and hydrogen ions: mitochondria. Lactate shuttles exist within cells that move lactate from the cytosol, where glycolysis occurs, to the mitochondria, where lactate can be metabolized. The hydrogen ions are then used to create a ATP via the electron transport chain. Lactate shuttles also exist in cells with a lower capacity for oxidative metabolic due to low mitochondrial number. In muscle this removes lactate from more glycolytic fibers and transfers it to more oxidative fibers within the same muscle. Additionally, lactate can be shipped to the liver where the liver converts lactate back in to glucose in a process called gluconeogenesis. As you can see, having a high number of mitochondria is important for preventing lactate accumulation and the acidic environment created from excess hydrogen ions. This is accomplished via 2 things: fasting and exercise. Fasting works by increasing the production of energy from fat, which occurs in the mitochondria. Exercise, on the other hand, generates lactate which acts as a signal in muscle to increase production of mitochondria to deal with the lactate and hydrogen ions. But this brings us to an important question…If exercise increases lactate, why is it beneficial? This all comes down to what is likely an important driver of acidity in the body, particularly the blood. Red blood cells lack mitochondria, so when they’re exposed to high levels of glucose, they create high levels of lactate and pump it out in to the blood causing increased plasma lactate. They also direct glucose through alternative pathways that create things like methylglyoxal that cause advanced glycation endproducts(AGEs). The hydrogen ions they create are likely directed to hydrogen peroxide. This can lead to lipid peroxidation which causes the production of toxic aldehydes. Both AGEs and aldehydes are key causes of the complications associated with Type 2 diabetes, including cancer. When we exercise, glucose in the blood is directed towards the working muscles. Acutely, this directs glucose to muscle cells where it can be fully metabolized by cells with mitochondria, along with the hydrogen produced in the process. Any excess lactate will be redistributed to cells in the muscle with a greater ability to metabolize lactate or get sent to the liver to produce more glucose. Chronically, this increases the number of mitochondria in your cells AND increases the amount of glycogen your muscles can store in the form of glycogen. Additionally, the liver more than likely gets better at processing lactate in to glucose. So what is the key takehome from this minor physiology lesson you may or may not have wanted? Increasing the number of mitochondria you have, via calorie restriction or exercise, is the ultimate solution to this problem of disturbed clock disruption from acidification of the cellular environment. Although, one could easily make the claim that mitochondrial deficiency due to caloric excess and sedentary behavior are the cause of the acidification in the first place. When we look at it from that perspective, you can see that consuming baking soda would simply act as a single shack in a game of whack-a-mole. It doesn’t correct hyperglycemia and the re-routing of glucose through alternative pathways that cause damage consistent with oxidative stress, which is linked to cancer as well as a number of diabetic complications. So how do we determine if we have enough mitochondria? There is really no real tried and true way to do this yet. But I think a very good way to assess this is by proxy. What is your resting heart rate? A good place to float is between 50-60bpm. What is your BMI? Standard measures of BMI are pretty accurate for the vast majority of people. Being in the healthy range indicates you aren’t in a chronically overfed, underactive state. Note: If you carry a high level of lean body mass this chart may not be an accurate indicator for you. If you’re not a bodybuilder or power athlete, this likely doesn’t pertain to you. Are you currently putting on weight every year? Even just a little? Stop! What is your hemoglobin A1c? This is measure of your 3 month average blood glucose and is measured by looking at the %age of your red blood cells that have been damaged by glycation. I prefer to be under 5.0%. Most treadmills in a gym can give you an approximate measure of your VO2 max, which is a measure of the maximum amount of oxygen you can consume during maximal exercise. Consult this chart for more info. If these numbers are off, baking soda will be of little use to you. Correcting these problems with exercise, caloric restriction, and addressing circadian rhythms are of far more use to you and your healthspan.